Secret Passion is a nice fashion store with a good boot section.. come on, heels like that you have to call fetish, don’t you? The cool part is, the Midnight are available in knee, calf, and ankle length, so you can get all three models if you love the look, and accessorize all your outfits with the best boot for each. There are a lot of very good details, like laces, folds, seams, a cute ankle strap with the buckle facing the right way ;) and of course, those killer sculpted heels. PS : Deirdre secret tip! The boots are mod, so add shine for a very different (and gorgeous) look! We went to the store finding Samy’s main product to be skins and the boots can be found, after a quick search, upstairs. We called Samy and she was so kind to talk to us, we just love it get the inside scoop first hand from the designers them selves. Seems we have mutual friends, my favourite boot designers, Tanja and WarDoom, from WarDoom Shoes. 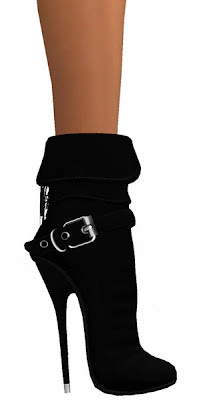 So like Mistress said, great fetish fashion boots, get them before everyone wears them.